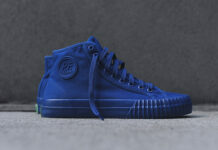 As a part of PF Flyers‘ ongoing Authentic American Style series, the brand has teamed up with designer Alysha Owerka-Moore for its latest set of videos. A streetwear pioneer with roots in its rise in the early ’90s, Owerka-Moore has worked as a part of countless partnerships over the years and has been responsible for the success of a number of brands and labels. Stepping away from the industry a bit in recent years, the designer now focuses on an array of projects and spins punk, garage rock and old school soul records in his spare time. Head on over to the PF Flyers site here to check out the series and catch Owerka-Moore’s thoughts on style, inspiration and more.